with the power to bestow boons on his fellow man." Joseph Campbell is famous for being the creator of Star Wars. Ooops. Sorry, George. Campbell wrote 'The Hero With A Thousand Faces' which, in essence, is a scholarly tome that concludes that our myths as a species – regardless of cultural differences – can be boiled down to some very basic story DNA. It's been acknowledged that George Lucas created his double trilogy with a little help from 'A Thousand Faces'. And no, that doesn't mean that the number one campfire story in the jungles of Borneo involves Imperial Star Destroyers. The hero's journey has very specific tent pegs on which to attach its guy ropes. In 1973's O Lucky Man!, we have a hero and we have a journey but in terms of settling into a rut of complacent and universal story-telling, this extraordinary film has none of it. This is an epic writ small, a movie that could not work transposed to any other culture. There is no Dreamworks remake in the offing. This is Britain, warts, smiles, venality and goodness all pressed together into a three hour phantasmagoria of anglo-idiosyncrasy. You know how little Little Britain could be (how sparse and vapid and repetitive. And repetitive?) O Lucky Man! Is big, brash and ballsy Britain. Welcome to civilization, Anderson-style. OLM! is possibly one of the most interesting British films of its time simply because it is unabashed in its political standpoint (why are there so few 'right wing' artists not including Jim Davidson? Please, for art's sake, do NOT include Jim Davidson). The film embraces the 'real' but not the realistic and in more than any other aspect, it panders to nothing; no 'what came before', no 'how can we make a profit? ', no casting stars although McDowell was well established by 1973 and the movie is based on his original story. OLM! is utterly unique and for that reason alone, it's not easily digestible for guts weaned on milky pap. But if you have the constitution, it's a zen-ish joy. I remember first seeing the smack on the head with the script and just after the fleeting "Jesus, that must have hurt," a feeling of rapturous joy came over me, like an intravenous high. I smiled faster than Travis... I'm getting ahead of myself (something Travis may have said in the third of his unofficial trilogy). But you really have to see Britannia Hospital to appreciate that gory little quip. As mentioned, OLM! Is based on an original story (The Coffee Man) by its star, Malcolm McDowell who plays, yet again, a character with the same name as a previous role, Mick Travis. 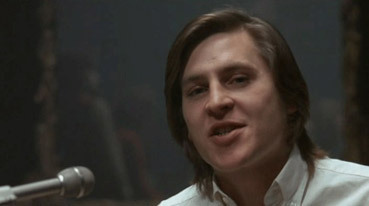 Personal sub-note: I knew (and still do as we are both still breathing) a boy called Mike Travers. He jumped off a 12 foot public toilet roof and landed on his shoulder and neck. He got up unhurt. I followed him pretending to be Thunderbird Two (I had the lining of my pockets sticking out from my shorts as wings) and landed on my foot. I broke it as well as all five toes. Bone pain is quite exquisite in the worst way. Personal note ends here. O, Unlucky Boy. Screenwriter David Sherwin admits in the commentary track that he could not see McDowell in any other way apart from naming him 'Mick Travis' – the same name he was given as the rebel in If.... despite the characters' obvious differences. This is a unique case of an actor possessing a character's name and there being no resemblances apart from physical between the three (the third Travis being the investigative reporter in Britannia Hospital also written by David Sherwin). There is some scuttlebutt that suggests that McDowell got Warner Brothers to release this version of OLM! in return for the actor's participation in the additional extras for their up and coming re-release of A Clockwork Orange. But this can't be true. Doesn't everyone in the film industry love each other? That's what all our behind the scenes documentaries tell us. OLM! is the story of a young man at the start of his adult life. He makes his way through almost every personification of the baser aspects of human nature in a series of meetings, coincidences and surreal situations that need no signposting or, indeed, explanations of any kind. Director Anderson ladles the sub-text on with relish and leaves it to us to sift through the iron sulfide to dig out the real gold. McDowell is a naïve cork on the ocean, a light, random soul bobbing on a raging sea that swells and throws him around like a rag doll in a washing machine. He is made clean by his director but more of that later. Fate has a lot in store for wide eyed, smiling Mick and O Lucky Man! is his journey from one absurd, sometimes surreal situation to the next. Anderson's aim was to make a movie grounded in the real with realism thrown out of the most convenient – and in one scene – literal window. Hence we get characters that pass hot coffee to each other by mouth, landladies waiting up in the beds of their new tenants, sheep-human hybrids (scary!) and the casual employment of a personal assistant after his predecessor is pulled to his doom by a mad professor. Oh, and that's just a fairly representative sample. 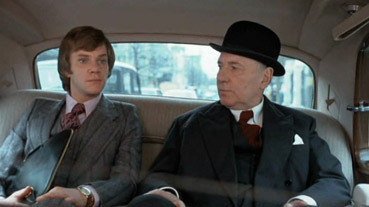 As I mentioned, if you like your movies challenging, witty, surreal, perceptive and staunchly critical of the political prevailing wind, then Lindsay Anderson is the man for you. Director Lindsay Anderson's requested epitaph. Anderson worked with a stock group of actors, all of whom turn up as more than one character in OLM! Reinforcing the idea throughout – that these characters are caricatures, ciphers in place to illustrate man's venal nature – the actors give their all. 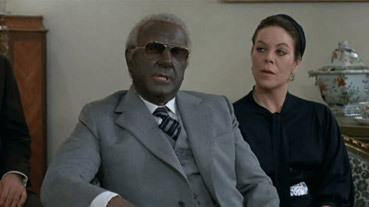 Witness Captain Mainwaring himself (Arthur Lowe) playing several parts and then almost shockingly turning up as a blacked up African president. It's a great revelation that Anderson baulked at the idea of 'black and white minstrelling' of one of his favoured actors and then in hindsight, he came around and fully supported the idea. I must admit to being a little uneasy but there is a sort of filmic sense to an Englishman blacking up to play a disgustingly awful African. It's a double bind... No, we're not racist, honest – suggesting that all Africans are bribable idiots (but if we are, at least it's an Englishman taking the rap). We present a bad man to be judged... Blacked up, is he worse than we feared? It's not as if Lowe is meant to be in the slightest bit convincing. It's a Brechtian approach (one of Anderson's more beloved intellectual dramatic pouffes upon which he puts his tired, directorial feet), one that acknowledges that the audience is complicit in knowing it's a white man blacked up. This becomes part of the effect. For a full explantion of 'Brechtian' (a dramatic supposition based on the intended effect on an audience born from the work of writer/dramatist Bertolt Brecht), please Google. Anderson delighted in being smarter and more widely read than everyone around him. He used his intellect as a playful jousting lance and McDowell was up to his taunting by virtue of his own boundless self-confidence. Intelligence and knowledge sometimes has to bow to aspects of another's character unrelated to the higher traits of wisdom. O Lucky Man! is almost an anti-movie. Yes, Mick Travis develops in the sense that a wide eyed innocent cannot remain so for too much longer after being tortured for being a Russian spy – so he has some growing to do but as a structural beam, his journey does not serve as a foundation for a narrative – and yet it does. 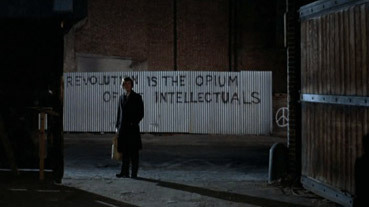 We have been browbeaten by what a film is and should be so much in the last 20 years that when something comes along (35 years ago, granted) that dispenses with Hollywood wisdom, punches Robert McKee in the solar plexus and puts the experience of experience front and centre, it's a breath of extra strong mint. There are ciphers and clichés and tropes and all manner of story telling crossroads and short cuts but Anderson seems hell bent on subverting almost every expectation. In turn, this keeps you guessing after every scene – politely punctuated by Anderson and his editor with a helpful two seconds of black spacing. The film is presented as 1.78:1 anamorphic presentation over two discs (approx 1 hour and 30 mins on each disc) with a dependable if a tad hissy Dolby Digital mono soundtrack. The break between disc 1 and 2 is at almost a random point mid scene. What were they thinking? There's a natural break just a few more minutes on. Strange. It's almost as if those in charge of pressing these discs don't watch the films. Could it be? The back of the DVD cover says and I quote: "...presented in a matted widescreen format..." Uh, OK. No evidence of matting but then there wouldn't be. From a nearly square 35mm area to a 1.78:1 requires the top and bottom of the exposed image to be matted out unless the matte was inside the camera creating black at the top and bottom on the original negative. Glad all that's sorted out then. There are English and French subtitles (and English for the hearing impaired) available for the movie and for the movie's commentary, just the English. The print is in good condition. There is a sort of wistful nostalgia that accompanies the viewing of O Lucky Man! – you can feel the film-makers' efforts in each scene. There is no post production fiddling and no grading that sticks out like Oliver Hardy's thumb. Yes, there are faint dust spots and the tiniest of scratches every few minutes but as McDowell says on the commentary, this is a really good print. This is a very good and authentic commentary track that may have yielded more gems if we had separate ones but the three in one works well. McDowell, obviously thinking that no one would possibly want to listen to the If.... and OLM! commentary tracks one after the other, tells some repeated stories but as they are entertaining, it's not too much of a criticism. Price is an unexpected bonus not because he reveals hitherto unknown talent for stand up comedy but his is such a pivotal role in the freewheeling style of OLM! that it's genuinely refreshing to hear him reminisce. This could just be me, of course, overdosing on Sherwin and McDowell on Anderson's early picture. This is a mid 70s making-of which one imagines was quite rare in those days of "it's in the cinema!" or it's nowhere to be found (no VHSs, no DVDs). I wonder where it may have been shown? It seems too short for a TV spot. Maybe it acted as an extended trailer. It's just quite rare to find this kind of coverage pre-the invention of the DV camcorder. Someone, somewhere decided to make this and perhaps they had visions of a future in which movies existed on shiny discs? And needed extras? Complete with sing-a-long captions, the trailer makes OLM! out to be a real romp (which in effect it is in a loose sense). In fact, the trailer looks like a bloody party! Smile! It's aged with the appropriate dirt but not excessively, so it's more than watchable. O Lucky Man! is a breath of fresh air. When British cinema was crawling into kitchen sinks and proselytising according to Monsieur Lowered Expectations (we whined "How can we compete with the Americans? 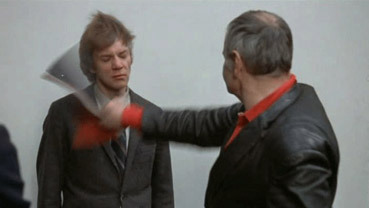 "), along comes Lindsay Anderson to shake things up a bit. OLM! Is disturbing, enlightening, funny and prophetic. What more do you need in a movie?